The following report and petition first appeared on the RedMed website. Solidarity is a signatory to the Turkish Revolutionary Workers Party’s petition in support of the metalworkers’ struggle. 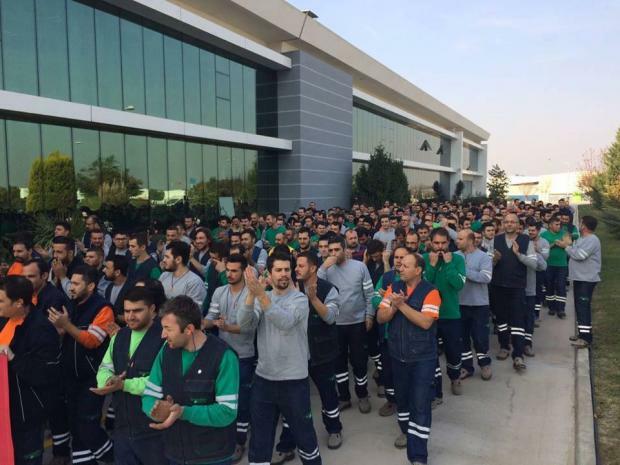 The metalworkers’ strike in Turkey, declared by all three unions present in that industry and involving around 130 thousand workers, ended with a partial victory for the workers. The bosses’ organization agreed to roughly eight times the wage raise that it had conceded on the first round of negotiations. Given the fact that one of the unions, by far the strongest in the industry, is a yellow union that was set up under the military dictatorship of the early 1980s precisely to regiment the struggle of metalworkers, itself the leading force in the struggles of the working class of Turkey up until that time, and that another of the three is affiliated to a confederation that slavishly follows the line of the AKP government, this in itself is quite an accomplishment. However, even more importantly, and of clear significance in terms of which side was able to impose its will, the term of the contract was held down to the conventional two years rather than the three advocated by the capitalists of the industry. The fact that these gains were wrenched in the context of a State of Emergency, which the AKP government, by Erdoğan’s own candid admission, uses against the workers and in the interests of the capitalists, and the concomitant ban that was declared on the strike even before it took off, is all the more reason to rejoice. These achievements are simply an outcome of the spectacular spontaneous movement of wildcat strike action accompanied by sporadic factory occupations waged by tens of thousands of metalworkers two and a half years ago, in May-June 2015. This movement was a full-scale reaction of fully-justified rage against the capitulation by the yellow union in that round of collective bargaining. Now, the union has apparently ended up mastering an immensely difficult situation, as a result of a visible change in its policy and at the expense of serious concessions on the part of the capitalists. It is yet be seen whether the bulk of the members of this union will simply go back to their earlier complacency as a result of the substantial gains made in this round of collective bargaining or whether with its newly acquired self-confidence deepen the process of challenging the policy of subservience to bosses to which the union is probably getting prepared to return to. The reason why this is only a partial victory is two-fold. On the one hand, the strike ban of the government, although questioned by at least two of the unions, was in the final analysis observed. It is true that the only class struggle union among the three openly declared that the ban does not “bind” them and that even the yellow union had to have recourse to some cosmetic action. Nonetheless, these actions were only preparatory skirmishes in what could have turned out to be a major class war, which would have been a threat to Erdoğan’s popularity among wide layers of the working class. On the other hand, and as was already pointed out, viewed in its entirety, the process ended up taking the wind out of the sails of the memorable movement of May-June 2015.
International solidarity always plays a positive part in the struggle of the working class. In this case, too, working class and socialist organizations from around the world, from the US to Russia, from Argentina to Azerbaijan, and from the Balkan countries contributed to encourage at least the more class-conscious elements among the metalworkers. This is all the more important at a time when the government of Turkey is trying to whip up a jingoistic and militaristic enthusiasm in favor of the war in Afrin in northern Syria. We publicly thank all of the organizations and individuals that have contributed to this international solidarity. Hands off the metalworkers’ strike in Turkey! Government ban means AKP despotism serves the bosses! International solidarity with metalworkers of Turkey! The Erdoğan-AKP government has banned the metalworkers’ strike crowning the collective bargaining process of fully 130 thousand workers. This is unlawful, illegitimate and unacceptable. 130 thousand metalworkers of Turkey declared a strike that was supposed to begin on 2 February 2018. The strike involves all three unions organized in the metal industry. Metal unions affiliated to three different confederations of absolutely contradictory ideological orientations are going on strike simultaneously. This fact alone is sufficient evidence of the urgency of the situation for the workers in this industry, since one of the unions, the largest, is a union that workers protested in their tens of thousands for its docility only two years ago and a second one is affiliated to the confederation controlled in hardly disguised form by the ruling AKP! The strike is meant to fight the imposition by the bosses’ organization of minimal wage raises in a situation where the metalworkers of Turkey already receive the lowest wages in comparable countries and work the longest hours with the lowest rate of absenteeism. As a novelty, the bosses also wish to extend the term of the collective bargaining agreement from the two-year period that is accepted as a rule across all industries in Turkey at all times to three years so as to be able to enjoy the benefits of low wages for a longer period of time. The 130 thousand strong striking workers would be a sufficiently powerful force to fight the bosses, were it not for the prospect of the intervention by the AKP government of Recep Tayyip Erdoğan on the side of the capitalists, mostly large joint ventures between Turkish and foreign imperialist corporations such as Ford Otosan, Renault, Mercedes, Tofaş (subsidiary of the Italian Fiat) and others. This government has banned three metalworkers’ strikes in the last three years, as well as large strikes in the glass, petrochemicals and banking industries. President of the republic Erdoğan himself has openly boasted in the past more than once that his government is using the State of Emergency, declared in response to the failed coup attempt in July 2016, to stop strikes! We support the just struggle of the metalworkers of Turkey against the imposition of unacceptable terms by the capitalists and declare our full solidarity against intervention by the government in the lawful right to strike by banning this very important action under whatever pretext. We call on working class forces in all countries to turn their attention on this strike: Erdoğan’s regime has been rightly criticized for its increasingly despotic practices. Banning a lawful strike is a clear example of those practices and exposes the Erdoğan regime for what it is: a government in the service of the bosses against the struggle of the working class. Metalworkers of Turkey, we are in solidarity with your action!